I am asking people to step up and help this spread the message by supporting the outreach of this film. There are two ways you can donate. If you would like to make a tax free donation, please do so through our fiscal sponsor, Film North. You can donate on Indiegogo. For non-Natives, the film dispels myths about Native peoples. For Natives the film reaffirms who they are. Law enforcement agencies, corporations and school districts have requested to screen the film. These are key influential groups. Color Correction, Sound Mixing/Editing, DCPs and DVDs, Aggregator fees, Legal and E/O Insurance, Closed Captioning, Public Relations, and Native Education. If you know anyone who will offer services on a pro-bono basis, please let me know. 1. Be an influencer and show your support by sharing the campaign link on your social media pages. 2. Talk about the film on social networks, like, follow, subscribe and share any of social media posts about the campaign and film. Even a simple like on a post will help increase awareness for the film. 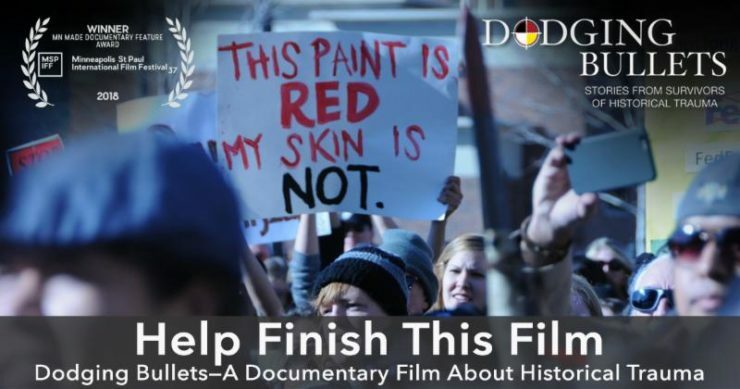 Dodging Bullets confronts Historical Trauma head-on through interviews and discussions with Native Americans whose lives are stricken the effects of Historical Trauma. Visit DodgingBullets.org for more information.